To print this chapter in flat-letter format, click here: Chapter 5 Requires free Adobe Reader. Looking on the Internet, I cannot find any interpretation for this ancient object with a small dial within a larger one, but its features seem to fit the X-Y spin-axis hypothesis. One chapter is not enough to try to explain these mystery clocks. It takes a bit of time getting used to the new ideas from ancient records that survived an asteroid impact destroying humanity’s earliest and great civilization mentioned in the Bible and many ancient myths. By comparing this clock with other clocks and connecting with their historical cultural settings, we can come up with a sensible explanation for all of these elaborate calendars and clock mechanisms. One thing must be kept in mind: before 588 BC the number of months in a year, as measured from solstice to solstice, was not always 12. It was often shorter in ancient times due to the backward residual spin of the earth’s wobble left over from the asteroid strike, which I call the X-axis. After the asteroid impact on 5 February 2287 BC the momentum of the pre-Flood X-axis carried forward in time and sometimes moved in a direction opposite of the pendulum Y-axis wobble, which made the zodiac constellations before 1400 BC appear 1 to 4 months less in Aztec times as compared to today’s predictable 12 months. The Z-axis revolution around the sun of 365 days still worked, but counting monthly cycles was different because the priests could not count on a dependable 12 months for each year. That is why a fixed order of zodiac constellations took the place of simply counting monthly cycles as the diminishing X-axis slowly merged with the Y-axis. For example, most of us can remember that the old Roman calendar had only 10 months in the year as measured from an X-axis remnant before Julius Caesar. The missing two months moved backwards due to the pendulum-like wobble, although the 365-day Z-axis had not changed. December is derived from the Roman name for 10 and not 12, yet it is the last month in a one-year cycle. This problem is analogous to climbing up a steep mountain only to slide backwards a little after making some progress up. In ancient Aztec Mexico, the priests kept track of time using pyramids. The pyramids provided good observation platforms to count each year from one solstice to the next, but you had to know where your changing calendar was in relation to the fixed zodiac constellations in the sky to calculate the accurate calendar date. That is why the Aztecs invented stone skull head markers that you can see piled up against a wall. They used them to keep track of lost months. I explain it later. Many bronze clocks were built but calibrating them was a problem if you lost your tables for some reason. This Persian gold- looking contraption could recalibrate any clock back to the start of a 25,625 Precession of the Equinox cycles, which means 2287 BC. Consequently, we might expect two different calendar cycles, one before and one after the asteroid strike - like two dials on a clock. Previously, I mentioned the Aztec cycles and connected them to an adjusted Hebrew cycle of 6,500 Gregorian years, that gave us a date of 4488 BC as the beginning of biblical history. This calendar allows for shorter Aztec 52 day-year cycles in which we need to add seven X-axis spins to go once around the sun, which was the 360-day Z-axis Babylonian year. Scholars date this Persian gold calculator to the 18 th century AD. Regardless of when it was made, the design fits 1800 BC much better. That would put it into Bronze Age alongside the Aztec calendar used to track the pendulum-like earth axis wobble in marking the seasons to keep accurate time. The Aztec calendar-system had to solve the same problems in marking time as those living on the other side of the world. Every culture experienced the same difficulty in adjusting its pre-Flood calendar, which only got worse as the centuries rolled along. What is known about the Indian clock shines some light on this subject for a balanced perspective. New clocks appeared around the world from time to time, and I am sure they needed to be calibrated to a standard on occasion. What you see in the Persia Astrolabe picture does the same thing but from another country and perspective similar to the 120 Aztec skull heads stacked up against the temple wall. If you go on the Internet, you can get a better and larger image of this clock so that you can see how detailed it is. 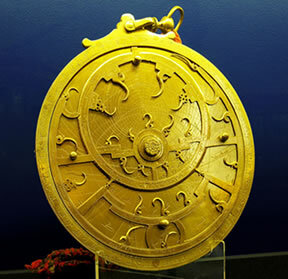 This Persia Astrolabe calculator measures Precessions of Equinoxes and relates them to the zodiac constellations over a period of 1,700 years (2288 BC – 588 BC = 1,700). After that, it would no longer be needed. It could help to adjust astronomical clocks like the astrological Prague clock covered later, but there were other ways to do that. Many astrological clocks exist, but they all end up with an axis position of 23½˚. Why? In ancient times, this was not the fact as there was another axis interfering with a calendar. This solid gold calculator projects a portion of the full turn wobble of our earth in the sky. The Aztecs followed five stars in order of progression: Polaris, Aldebaran, Taw Herculis, Vegas and Thubor. At AD 2000 the earth’s axis spin is centered on Polaris. Consequently, one full wobble turn is 25,625 Aztec years. The asteroid strike on 5 February 2287 BC changed everything causing many problems with dating history and understanding ancient calendars. These five stars divide into five equal 72˚ segments from star to star to complete a 360˚circle. That would make one cycle 5,125 Aztec years long, but I figured out how to calibrate the biblical chronology to Gregorian time and with that converted Aztec years into Gregorian years. We must decrease the projected 23½˚ end to the axis wobble by five constellations, if we want to align the Aztec calendar with other ancient clocks. They all started their calendar count from a fixed constellation in the sky at the point of the asteroid impact. The adjusted time measured from the biblical eyewitnesses recorded in Genesis can be converted to our Gregorian count by mathematical reasoning, which results in equating 6,500 Gregorian years to 72˚. This spin-axis hypothesis is very important, as scientists have no idea it exists. They do not yet recognize how an asteroid strike could have affected calendar changes. They make it harder for themselves by rejecting Biblical data as unacceptable religious teaching not to be considered. Hopefully, we can differentiate between religion and what is scientific data connected to a 4,000-year old religious book we call the Bible. Back to my analogy of the two-rail track railroad being more balanced. Most educators do not include biblical truth and therefore can only lead to an unbalanced monorail perspective. Notice that the picture of the Persian calculator has 72 little fields around its periphery. Each field has five little dots spaced on it, perhaps reminding us of the five precession stars in the Aztec system. The 72 fields represent the circumference of a 47˚wobble, so there is a little subdivision of five dots for each degree. Most Aztec clocks and temple pictures show the five-dot system, which has a mathematical base of 25,625/5 = 5,125 for one section of 72 degrees termed the precession of the equinoxes. Counting the section on the outer periphery, I find 72˚, or 72 times one degree spread over newly adjusted 6,500 Gregorian years. On the bottom, you will notice a curved bowl with a center knob. On either side, there is a space to move the big dial either left or right. The space on either side is like two fields, each being five dot-fields wide, meaning a range of plus-minus adjustment of two degrees. Now we need to find out how much one degree is in years. In chapter 2, we learned that 6,500 Gregorian years is equal to 72˚ of the Aztec precession and arrived at 23½ degrees tilt axis. Now we divide 6,500 into 72 and we get 90 years for one degree. (6500/72=90) accordingly the calibration range is +/- 2 degrees or 180 years on either side. Each degree has a number or name engraved around its periphery. It looks like it can be moved to indicate a coordinate engraved on the bottom plate by pointed hooks. On top you will notice a five-dot wide tongue in the 12 o’clock position like a clock hand where you start, and I believe set your date like we count years from a AD 2012 Polaris position or use the 2287 BC. The outer 72 notches therefore represent a particular century counted from 2287 BC. When I looked at the inscribed circles, it appears there is a North Pole line-scribed globe. I found that the center of the circle is off by a five-dot width perhaps simulating the 23½-degree tilt axis. That means there is an offset of one degree, or 90 years is the adjustment range for finding the appropriate zodiac position in the sky in any particular century. I overlaid the photograph with a plastic pencil circle guide that draftsmen use. I placed the faintly marked largest globe line circle over it and noticed that it will touch the center knob and the outer inside rim to find a ratio of the inner to the outer dial. I also realized that there are seven hook-tip positions within the penciled or North Pole circle. This represents the old X-axis positions before the asteroid hit the earth in Noah’s time before 2288 BC, being connected to Thuban-Taw Herculis. The smaller golden circle has 13 hooks positioned to align with moon cycles, and the large circle has 12 hooks typical of an Aztec calendar system. The hook-tip points to an engraved line on the bottom tablet, which correlates to a table calendar and star constellations. So the smaller circle is divided by an off-centered horizontal bar that is the center of the big circle. This functions like dividing years before the asteroid (before 2287 BC) to calendar dates after. Above the horizontal line, we have 7 hook-tips pointing to circular North Pole mapped out calendar spin X-axis according to the Aztec pattern. Below the horizontal line, we have 6 mounted hook-tips to indicate the Y-axis spin merging with the X-axis at about 518 BC. This would translate time cycles after 2287 BC with six 300-year periods each for a total range of 1,800 years to arrive at about 518 BC. The 300 years is the adjustment range I previously mentioned. It is like 2 times 90 years on each side, or a little more than two rows of stone skull heads from the pile of 120 in the Aztec system I describe later. When we want to align a hook tip over a fine line, we need a little more room on the right and left. That is the reason we have 180-year adjustment range, which is more than is needed. The machined metal bar is long enough for 180 years of adjustment, but we only need 150 years (+/- six times or +/- 10 skulls x 15 years), ending eventually at the 23½-degree rotational axis tilt in 588 BC. The five unfinished pyramids in Mexico City have a 215-year interval range to adjust their calendars after the Flood. This is very similar data. Notice the discrepancy between my 180-year adjustment range versus the 2 degrees x 72 = 144 years, which is very close to 10 Aztec stone skulls = 143 years (10x14.3). The Spanish friar recorded Aztec precessions that came after the Flood. I try to start my reference before the Flood in order to include the event of the X-Y axis change. It is just a matter of a different perspective and does not matter when calculating dates. The small inner circle and horizontal bar divides calendar time at 2287 BC when the earth had a different rotational pattern and consequently a different calendar, although its orbit around the sun may have changed a little from 360 to 365 days on the Z-axis. The outer big circle connects to the inner circle at a specific X-Y ratio like an offset teeter-totter balance. Therefore, it marks 12 zodiac positions like modern methods after the 2287 BC date with 12 hook-tips. Remember, the twice the size wobble sees more reference stars on the periphery, which must be translated into a spin-axis turn referenced to the 360 degree Z-axis. In the beginning, the precessions turned twice in a year and stopped at one turn during Moses’ life. That is how the Aztecs could measure 5,125 cycles once the sky stopped. When both the sky is moving and the axis is moving, any calendar calculation becomes very difficult. They solved the problem by using two circles that interacted to find relative positions to the Z-axis that kept track of the seasons, something so very essential when you plant your vegetables close to snow line. Two dials, one smaller indicating the X-axis and a larger dial indicating the Y-axis would be needed to determine specific dates in a declining pendulum wobble. Translated into Zodiac star positions, must have a calibration point of one star that the sky rotates around, which in our timeframe is Polaris. In ancient times, it was a series starting from Tau Herculis-Thuban moving in the direction of Polaris. Then the wobble turned in tighter and tighter circles until it stopped at 23½ degrees. A slight adjustment of the bottom knob plus-minus 2 degrees would get your hook switched over to the next line, which has a name for identification engraved to adjust or start counting your constellation in the sky using a flexible X-Y axis calendar to determine a particular date in the future or past that you wanted to know. If you read about the Bronze Himmelsscheibe on the Internet, you will again see the 13 moon cycles and 12-month year relationship imprinted on a gold sickle connected with 40 Aztec (Hebrew) holes on the periphery. Subsequently here too we have 13 hooks indicate 13 moon cycle crossovers within a 12 Zodiac cycles. I wish I could see the backside of this Persian clock, which I am told, has more lines crossing. The back might give me the exact date when it was made, but the design features only apply to sky conditions from before 588 BC. Thus, the smaller circle represents the X-axis and the large circle is the Y-axis, which engage like gears with relationship determined by a factor of Greek letter π (pi) required for working mathematically with circles. Let’s learn about other unknown clocks and come back to this calculator again. I am sure we will find additional features we cannot see clearly yet. My first educated guess at all this may be a little off, but that is how good stuff gets invented. One must experiment with ideas back and forth. Notice the next pictures which have the same pattern of 72 sections around its periphery, but seems to be identical to the Chinese Bronze plate clock we will see later. Different continents present the same X-Y axis solutions because the astronomical phenomena of the unwinding axis wobble were the same worldwide. Astrolabe, by Muhammad Amin ibn Amirza Khan an-Nakha'i, Persian, 1587/8 (Inv. 52399). Pictures taken from Museum of the History of Science. © 2007 Faith in the Future Foundation. All rights reserved.